Includes 256MB internal memory, with optional image resizing (to maximize internal memory). Perfect gift for my college student. My son loves this frame! Expensive... but it looks great. The frame was easy to setup. I normally like to read the directions for new electronics but I was able to simply hook the frame up to my Macbook, create a new folder and copy the "2008" pictures that made the cut. My lack of awareness of feature concerns beyond picture quality let me buy this frame without reservation. (1) On Mac, using iPhoto to export pictures is a breeze. Each file is roughly 500 k with Maximum quality - Large format JPEG, which means that the internal 256 MB memory stores ~500 pictures. I've tried lower quality compression that produced smaller files; the pictures still looked very good. (2) The auto-rotation works like a charm. (3) I agree with other reviewers that I wish that there is a way to select sub-directory for display. (4) Folding the stand back to its storage position is a bit tricky. I was afraid that the plastic housing was going to break. Remember to push the ball-joint downward till it clicked before returning the arm to the storage receptacle. - Display. Wonderful quality. Brilliant colors. Good resolution, even when all pictures were downsized to 800x600. - 4/3 display ratio is the best fit for most pictures. - Easy to understand menus. Easy navigation. - Using all 4 cards you can store up to 40,000 pictures, plus 500 more from the internal memory. - Can't set to display pictures simultaneously from all sources (SD, CF, Memory stick, xD). This restricts display to 10,000 pictures maximum. - When in random mode, you can't go back to previous picture. It always jumps to the next picture. - At least 2GB cards are supported, however it won't display more than the maximum of 10,000 pictures (from each card). - I wish it had more than one timer. backstop leans frame only about 10 degrees. Would prefer if it leaned back a bit more. - Will not separate folders. For example If you have a memory card/stick or USB flash drive with separate folders for vacation pics, party pics, and wedding pics the frame plays them all. If you want to view a slideshow of just one of those folders, you have to delete the others from your media. - Does not show picture names. This would be a great feature so you would not have to explain everything in the pic to whoever is viewing it. + you can actually turn off the Sony logo on the bottom of the frame. + displays altered/adjusted photos with no issues. Most of our pics have been cleaned up with Corel Photo Paint Pro X2 and we have had no problems. Other reviews mentioned problems with Photoshopped jpegs but either Sony has resolved this issue or the Corel program doesn't affect the picture the same way the Adobe program does. So far all the photo features work nicely and the process of uploading photos from a computer work seamlessly. I am not sure how long the remote will continue to work as the "buttons" are small and hard to isolate and push down. One of the clock features (old analog type) that my in-laws particularly liked started pixelating or breaking apart on the screen so that you could not see the clock anymore. Email advice from Sony to do a "re-set" did not solve the problem. We do not use that feature any more and selected a digital like clock with the date instead. I think this product works fairly well for people that aren't thinking of ridiculously cool networking in mind. It's for the consumer to some experienced users. 2. Semi - Pro - There is an HDMI output that allows you to output to an HDMI equipped TV. It's good enough for casual view (which is what I think most people will buy this for), but it's not amazing and I wonder whether it really preserves the image's original size (I use an 8 MP camera) or it outputs the picture as the scaled down image of what the frame's resolution is. For more net savvy users, I would probably get something with a wireless g card that does a better job automatically updating pictures. One of things I think is pretty flawed about this frame model is that when you put it on shuffle, it really doesnt do a good job of keeping a good mix of pictures. If you're like me, I take many pictures that are similar and I keep them around in the event I want to get different perspectives of the same location/person/thing/etc. But, with the shuffle feature, the frame doesn't really shuffle in a smart way to spread out these "similar" pictures enough to really feel like you're getting a fresh batch of pictures every 10 seconds or so. Same problem as everyone else with the clock and when you turn on the unit it always start in the same picture; it does not take into account where it was previously. 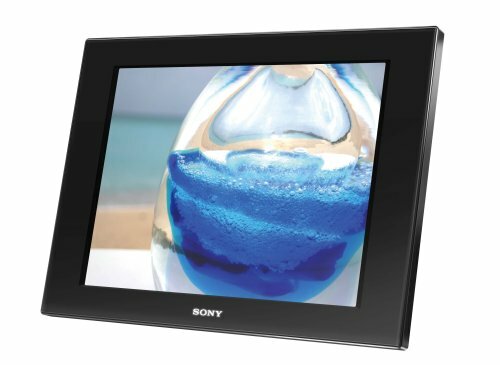 Sony Digital Picture Frame- User Friendly! I purchased this frame as a gift for my parents and set it up in advance with an image card full of family photos. It is a sleek and stylish looking display, not cheap or cheesy like some that try for the more "picture frame" styling. I love the way you can set it on the table in either portrait or landscape orientation and the images flip around to display correctly automatically. The images look great, color is rich and even low resolution pictures look decent. There were a couple of things that prevent a full 5-star grade. Though I managed to get the frame to display the pictures the way I wanted it to, it seemed like it took me a lot of trial and error. And I am pretty tech savvy. The menu system is a good idea, but I always seemed to choose the wrong menu option for what I wanted to do or I thought I'd chosen the right selection but when the display began, it wasn't what I expected. And what is up with only a 24 hour clock option in the digital time display? All in all I think this is a great frame, I wouldn't mind having one for myself and I am sure my parents are going to enjoy the one I gave them. I had been on the fence about getting a digital photo frame for almost a couple of years now, but it seemed as though the ones I thought were affordable were also a bit cheap looking. I happened across the Sony DPF-V900 frame at an electronics store, and immediately fell in love with it. "Affordable" needed to be redefined. The frame is striking, but without being over the top or gaudy. The image quality is absolutely top notch. The only LCD I've seen that looks quite as good is on my MacBook Pro. The function buttons are intelligently placed, and hidden from view at most angles, and there isn't an obvious sensor on the front for the remote control. In terms of features, you get a mixed bag that keeps this from being a five star product. The image correction is hit-or-miss. More often than not, the face detection works, but usually at the cost of degrading the rest of the image (fortunately, this isn't an automatic setting). There are loads of settings that let you customize how pictures are displayed, whether or not the Sony logo is visible, automatic power on / off, and so on -- but navigating the menus is a bit of a chore. You can easily spend about 15 minutes getting it set up just the way you want. One particular note: There's a display mode that lets you see a clock next to your images, but the clock doesn't show current time. It *should* show you the time the picture was taken, but it assumes the timestamp on the file is the correct time, not the EXIF data. Personally, I'd prefer a clock. Getting photos on to the DPF-V900 is incredibly simple. Connect a mini-USB cable to your Mac or Windows computer, and it mounts as a drive for drag-and-drop copying. Or, it'll read just about every memory card format out there.